NASA astronaut Rick Mastracchio performs a spacewalk outside the International Space Station on Dec. 22, 2013, the first of two spacewalks to replace an ammonia coolant pump in one of two cooling loops on the orbiting lab. Mastracchio recently told SPACE.com that he was looking forward to Christmas in space, and expected to call his wife and other family and friends today. "First of all, we have great connectivity with our family back home," Mastracchio said in a Dec. 13 interview. "We have an I.P. (Internet protocol) phone, and the ground sets up video conferences with our family on the holiday." Mastracchio said there are decorations on the space station to "liven up the place a little bit," and that the theme of togetherness for the holidays reaches all the way into space. "Of course, all six of us will get together and have a special meal, and everyone will pull out whatever special foods we have that are appropriate for the holidays," Mastracchio said. "And we'll just spend time together as a crew and good friends, enjoying each other's company." Mastracchio and his crewmates were expecting some holiday treats on a private Cygnus cargo ship that was slated to launch to space station in mid-December. But that delivery was delayed to early January following the station's cooling system malfunction. NASA spokesman Josh Byerly at the agency's Johnson Space Center in Houston said the space station crew has an off-duty day today, though Mission Control will staffed to support the crew. "Mission Control will have a Christmas dinner provided by management," Byerly told SPACE.com in an email. The first American Christmas holiday aboard a space station occurred in 1973 during the Skylab 4 mission to the first American space station Skylab. The station's three-man crew saved up their food cans to create this space Christmas tree. Christmas has been celebrated in space for decades. NASA's Apollo 8 astronauts marked Christmas at the moon in 1968, and Skylab astronauts built a homemade Christmas tree out of food cans in 1973. On the International Space Station, astronauts and cosmonauts have celebrated holidays since the first crew — Expedition 1 — took up residence in 2000. The station crew will have New Year's Day off as well, Byerly said. You can send Mastracchio a holiday message via Twitter by sending notes to him at @AstroRM. Hopkins can be reached at @AstroIllini. The holidays have been an unexpectedly busy time for the space station crew after a cooling system malfunction on Dec. 11. NASA tracked the problem to a suspect valve in one of two cooling system loops, and ordered a spacewalk repair. Mastracchio and Hopkins performed spacewalks on Dec. 21 and Dec. 24 to remove the affected cooling pump and replace it with a spare. On Friday (Dec. 27), Russian cosmonauts Oleg Kotov and Sergey Ryazanskiy will also venture outside the space station to install new science experiments and camera gear on the space station's exterior — work unrelated to the U.S. repair spacewalks. 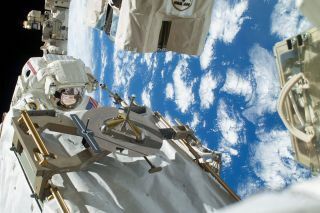 You can watch the Russian spacewalk live on SPACE.com beginning at 7:30 a.m. EST (1230 GMT), courtesy of NASA. It is expected to last seven hours.